The USP of any converting software is its robustness, accuracy and above all its conversion speed. Gone are those days where people would wait for long hour’s in order to get their conversion done. PowerFlashPoint scores here by converting PowerPoint to Flash at a lightning speed, almost three times faster than its competitors that too without compromising its output quality. The main purpose of using flash being its ability to display rich multimedia content at a very low file size, PowerFlashPoint gets into the complex details of PowerPoint, reads each entity one by one (text, shape, animation, transition, timing etc.) and then converts it to a highly compressed Macromedia Flash format which can be used for instant web delivery. Now I can create a Flash banner for my site. All by myself!! You have the ideas but do not have the expertise to create a Flash banner / intro using Macromedia Flash suite. Don’t worry - PowerFlashPoint - PowerPoint to Flash conversion tool is the best option to help you in this scenario. With the advent of Office 2007, PowerPoint has been voted as the most sophisticated user-friendly multimedia editing environment creative heads have ever seen. All you need to do is to create a cool banner slideshow (with banner frame size) with PowerPoint and then within a click PowerFlashPoint neatly converts your banner slideshow to a Flash banner keeping all special effects intact – that too so perfect than you would have ever imagined. It’s high time to say good bye to expensive flash programmers. 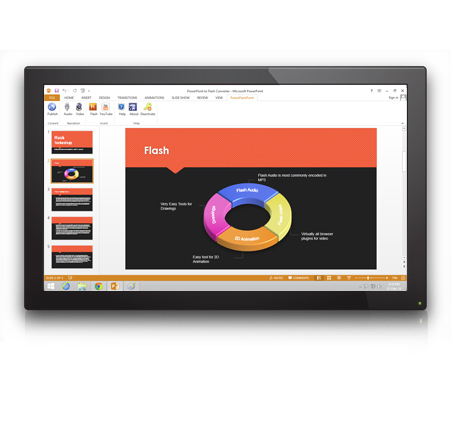 Take advantage of PowerPoint to Flash technology and easily integrate it into your software using our SDK (Software Developing Kit). Developers can leverage our advanced PowerPoint to Flash conversion tool in an easy, fast and economical way for Desktop applications, Web applications or Web services. 99% of the animations in PowerPoint are accurately preserved using Flash conversion technology. After conversion the output perfectly retains all major transition effects of original PowerPoint presentation. Fonts and effects used in the PowerPoint presentation retains their original appearance when converted to Flash format.